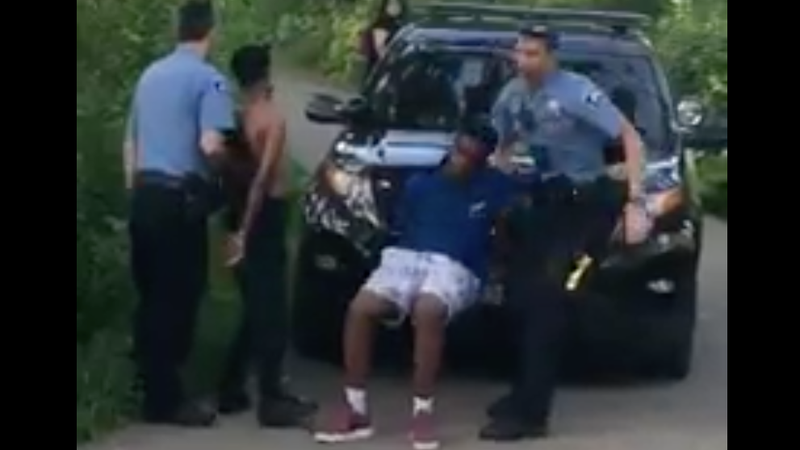 Police are apologizing for pulling their guns on black children after a video showed cops detaining two black kids in a Minnesota Park. But don’t worry, after investigating the incident, the police determined that there was no factual basis for them to draw their guns on the kids and put them in handcuffs. Everything’s fine. “Today at Minnehaha Falls cops drew guns on 4 black kids ages probably ranging from 9-12,” Facebook user Brianna Lindell posted along with the now-viral video. A girl with him was on her phone, I’m assuming with police. Some people near by approached and seemed to deescalate the situation. We walked further and heard shouting and when we came back around we saw a squad car. Two of the children were handcuffed and in front of the squad car. One was begging for his shirt on the ground because he was being bitten by mosquitos. My partner tossed him his shirt and a cop jumped out of the squad car and started yelling at us that we were interfering with an arrest. I asked the cop why he was arresting the kids as they’d done nothing wrong and he said they had received a call that the kids had a gun. We were approached by the people who had been deescalating earlier who told us that both cops had jumped out of their cars, guns already drawn, with the guns right in the children’s faces. The family was also black and the mother said her and her son had ran and hid when the police arrived because they were waving their guns around. Her little boy kept asking if they were going to be arrested too. As the video begins, Lindell focuses on the young boys, one of which is bare-chested, calmly sitting on the ground brandishing their non-existent weapons. Passersby enter in and out of the frame, unable to stand still as they are being bitten by mosquitos. But the cops leave the shirtless child on the ground as he squirms in an apparent attempt to fend off the insects. When asked to describe what happened, Lindell explains: “An older white kid, who’s probably 17, and coming at them with a garbage can lid, threatening them and calling them the n-word when we passed by earlier. And cops come and they’re arresting the kids, apparently. The cop said they tried to find the other kid, to no avail. When he asked the bystanders to help him do his job, a woman steps forward to speak to the officer—without a gun—proving that it is possible to converse with law enforcement without a glock in your face. After the video went viral, Minnesota Park Police say they received a call about four kids with a knife, a stick and a firearm in a backpack. The responding officer “drew his weapon” while detaining the kids, but didn’t point it at any of them, reports the local CBS station. At the press conference, Bourn, along with Minneapolis Park and Recreation Board Superintendent Mary Merrill and Park Police Chief Jason Ohotto said no weapons were found and the boys were safe at home, presumably tending to their mosquito bites during their copious amounts of free time on their hands now that they curiously have no desire to go to the park. “We have serious questions about the validity of what was reported in the 911 call,” explained Chief Ohotto, smoothly skipping over the fact that his officer thought it necessary to pull a gun on empty-handed preteens. “Tell me about it,” said Philando Castile, from his grave 10 miles away.